Adding inherently unreliable and heavily subsidised wind and solar to your grid is a guarantee of rocketing power prices. Every place in the world that got serious about wind and solar is being belted with serious increases in electricity costs. Wind and solar ‘powered’ Germany and wind ‘powered’ Denmark pay Europe’s highest power prices, by a mile, and prices in both cases are still climbing at double-digit rates. Germany’s power market is in chaos, and its grid on the brink of total collapse. The annual cost of the subsidies directed to wind and solar is colossal: the annual cost to British power consumers and taxpayers in the UK, alone, is in excess of £6,000,000,000. In those European states which plugged in to wind and solar, power prices are more than 50% higher than those G20 members that didn’t. Not that the EU boffins and bureaucrats are all that keen to level with Europeans. As John Constable points out, there’s a tendency to grossly overstate the purported benefits and vastly understate the true (and staggering) costs of Europe’s ‘inevitable’ transition to an all wind and sun powered future. 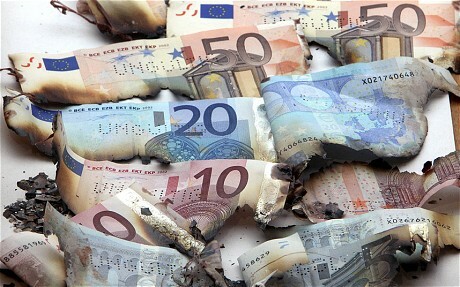 John Constable of the Global Warming Policy Forum (GWPF) claims the EU Commission climate policy report contains a “substantive error”, miscalculating the cost of annual levies on UK consumers by £4.8 billion. He said the initial bill claimed subsidies would be £1.3bn, when the correct figure is closer to £6.1bn. A spokesman for the EU Commission said: “You are correct that the largest part of the other subsidies was from the Renewables Obligation and that these were not allocated to ‘financed by end users’ as they should have been. Mr Constable said the miscalculation will have “consequences for all sections” of the report’s overall findings and estimates. Here’s the full analysis from John Constable. 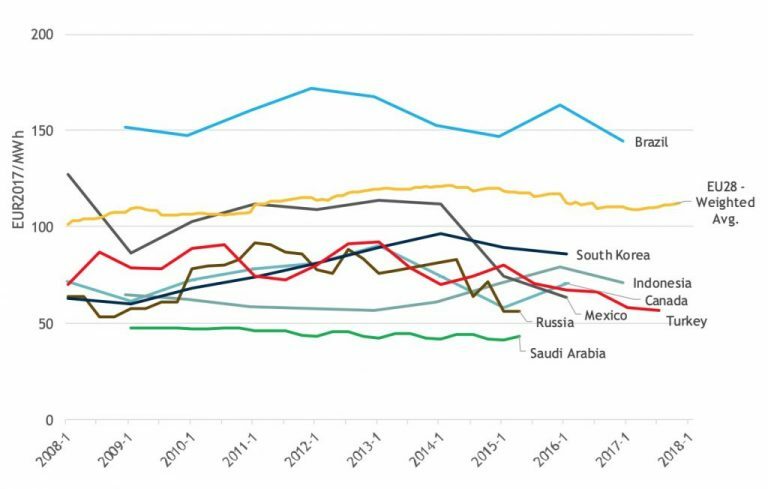 The third release of the EU Commission’s periodic study of global electricity and gas prices for the first time compares the EU 28 with the whole of the G20 for the period 2008 to 2016. EU 28 household electricity prices are now more than double those in the G20, while industrial electricity prices are now nearly 50% higher. The only G20 states with higher industrial electricity prices are those with heavy commitments to renewables. Some might discount this remark given the article a few days later in the Sunday Times (17.02.19), rehashing and warming over old news from August 2018 to the effect that Mr Ratcliffe is, apparently, locating his own tax affairs just outside the EU, in Monaco. Other readers, with more experience of the tides in the affairs of newspapers, will be inclined to think that if Mr Ratcliffe, a well-known supporter of Brexit, is worth this sort of non-coincidental criticism he might actually be on to something. Indeed, it is not necessary to look far for evidence that Mr Ratcliffe’s remarks on energy find an echo even within Brussels itself. Indeed, as recently as January this year, the Directorate-General for Energy in the European Commission published a 750 page attempt to assess the impacts of its energy and climate policies: Study on energy prices, costs and subsidies and their impact on industry and households. This analysis has been under-reported, perhaps because it is the third edition of a work previously released in 2014 and 2016 and so little new was expected in the 2019 update. However, this version significantly extends the range of the study, now comparing the EU 28 to the whole of the G20, adding more detail on matters relating to competitiveness, sections on the consequences of price regulation, and detailed attempts at a “new econometric analysis of the impact of subsidies on energy prices and costs” (p. 15). There is much to quarrel with here, and some substantive and indeed significant errors (see for example Table 6-15 where the UK’s subsidies to renewables in 2016 are reported as €1.57 billion, whereas the correct figure is closer to €7 billion). But disagreements and mistakes aside, this is not a minor or superficial study and anyone deeply interested in the subject will wish to turn its pages at least once. Figure 1. EU28 weighted average electricity and natural gas prices compared to G20 weighted (by trade with EU) average prices, 2017 €/MWh. Source: Trinomics for DG Energy, Study on energy prices, costs and subsidies and their impact on industry and households (2019), 17. The authors believe that by assembling “multiple international, EU, national and commercial sources” they have produced “one of the most comprehensive and comparable sets of international price data current available” (p. 16). These are, then, no mere snapshots, but a far-reaching attempt to get to grips with a very extensive body of information, and the findings are clearly as important they are stark and unambiguous. While wholesale prices of gas and electricity in the EU28 and the G20 are broadly comparable both in magnitude and in trend (falling in both cases), EU28 retail prices are significantly higher and in the case of electricity are not only much higher but have also exhibited until very recently a clear rising trend. Specifically, since 2008, EU28 household electricity prices have been well over and are now more than double those in the G20. This has obvious and very serious consequences for the cost of labour. No wonder the EU needs remedial social policies. Industrial electricity prices in the EU28 are now nearly 50% higher than those in the G20, and, bizarrely, are actually higher than domestic retail electricity prices in the G20. No factory closure in the EU, Honda in Swindon say, no manufacturing migration, Dyson to Singapore for example, should surprise anyone. The gulf separating the industrial electricity prices within the EU in aggregate from the rest of the world is particularly remarkable in the light of the fact that energy intensive users in the EU are for the most part protected against the full impact of policies by tax relief and other exemptions. Figure 6-25 (p. 280) of the study shows that electricity prices to intensive energy users in Germany, for example, would be nearly 40% higher without tax relief and exemptions that shift the burden on to other consumers. 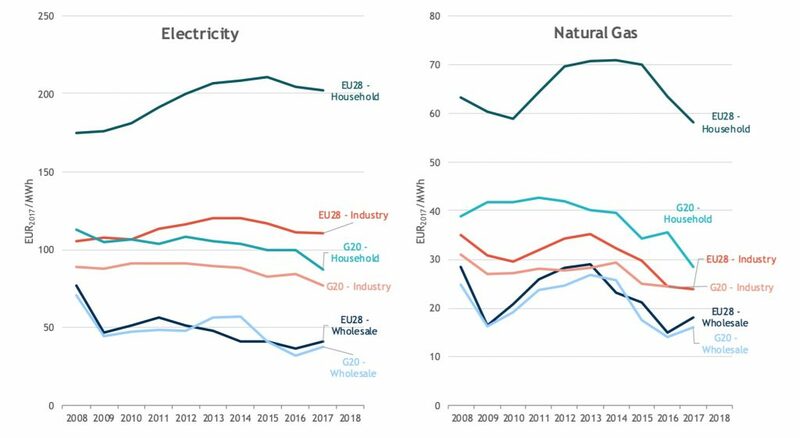 If those consumers, domestic households prominent amongst them, were not taking a disproportionately high share of the direct impact of the EU’s energy and climate policies, the competitive disadvantage of European industry would be still greater. Domestic electricity may be maddeningly expensive in the EU28, but those burdened bill payers thankfully have jobs, at least they do in Germany and for the time being. – The UK, one has to note from Figure 6-25, has the highest overall prices to energy-intensive users and one of the smallest levels of policy exemption. Some consolation might be found in the fact that industrial prices in the EU28 and the G20 are at present roughly equivalent . However, while process heat may be competitively priced in the EU, it is electrically powered, precision production methods that are closely associated with the very high value manufacturing which the EU member states must hope to retain in competition with the rest of the world. Bluntly, important though gas is as a fuel for final consumption in factories and businesses, it probably matters less to the emerging future of European industry, not to mention transport, than electricity. 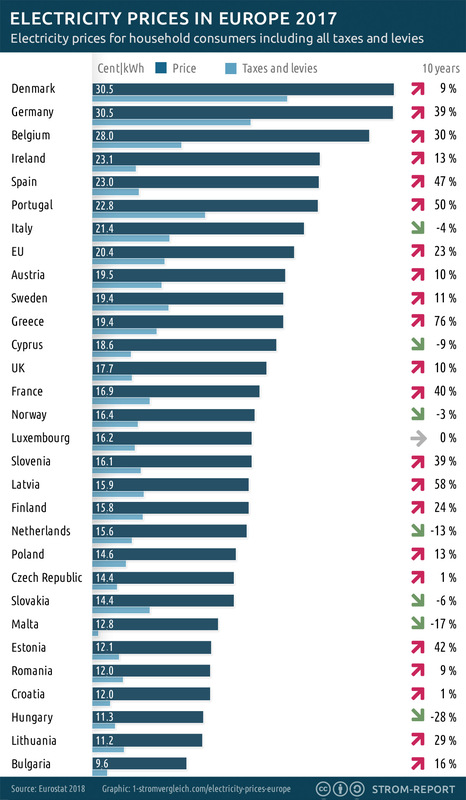 The authors correctly attribute the high electricity prices in the EU 28 to the “tax regime”, by which of course is meant energy and climate policies, where the EU is out of step with the rest of the world. As the authors themselves gloomily comment: “Whilst a convergence in tax rates may occur if other G20 countries implement similar fiscal measures as the EU as part of their climate mitigation policies, there is as yet little evidence that this is the case” (p. 16). So much for the “leadership” exhibited by the EU; no one is following that lead or seems likely to do so. The main body of the study provides further detail on the climate policy determined divergence in electricity prices. Consider, for example the following three charts, the first two charting actual prices and the last providing an indexed comparison. 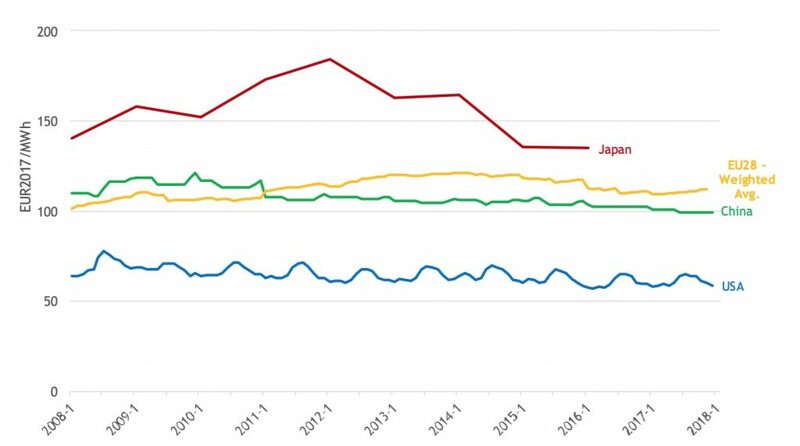 Figure 2: Electricity prices, industry retail, EU28, USA, China, Japan, 2008–2018, 2017 €/MWh. Source: Trinomics for DG Energy, Study on energy prices, costs and subsidies and their impact on industry and households(2019), 65. Figure 3: Electricity prices, industry retail, EU28, other G20, 2008–2018, 2017 €/MWh. Source: Trinomics for DG Energy, Study on energy prices, costs and subsidies and their impact on industry and households(2019), 66. 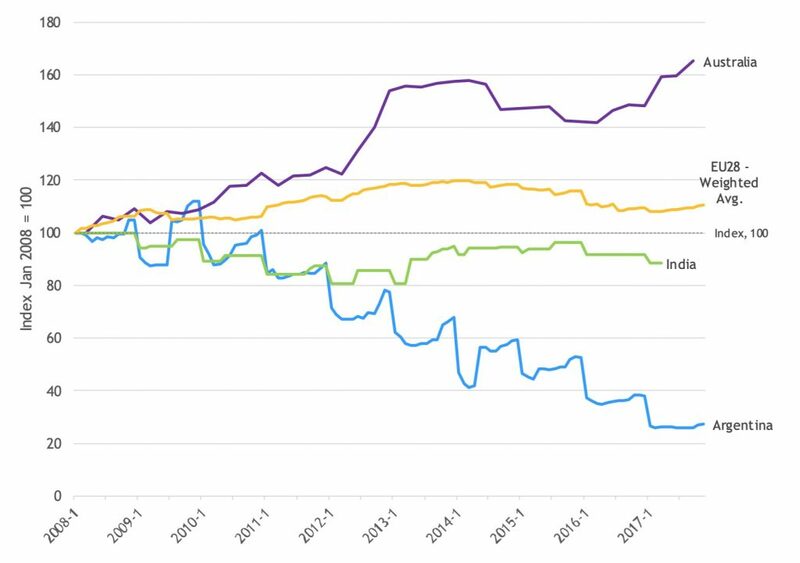 Figure 4: Electricity price indices, industry retail, EU28, Australia, India, Argentina, 2008–2018, 2008=100, constant prices. Source: Trinomics for DG Energy, Study on energy prices, costs and subsidies and their impact on industry and households(2019), 66. While it is not surprising that retail electricity prices in China are now lower than those in the EU, the margin is perhaps not as dramatic as might have been expected, a reminder that low cost process heat from coal has been more important to Chinese growth than electricity. However, cheap electricity really does matter in the high-tech, high wage economies of the United States, South Korea, and Canada, and in rapidly growing countries such as Indonesia, Turkey and Mexico. The EU will obviously struggle to compete with such locations for the development of sophisticated industrial processes. It is also worth observing, which the Commission’s study does not, that the only major G20 states with higher industrial electricity prices than the EU28 are Japan, which has closed and is only slowly re-opening its nuclear fleet while in the meantime generating from expensively imported Liquefied Natural Gas and a vast fleet of extravagantly subsidised solar-photovoltaics, and Brazil which is at least as heavily committed to renewables as the EU itself. 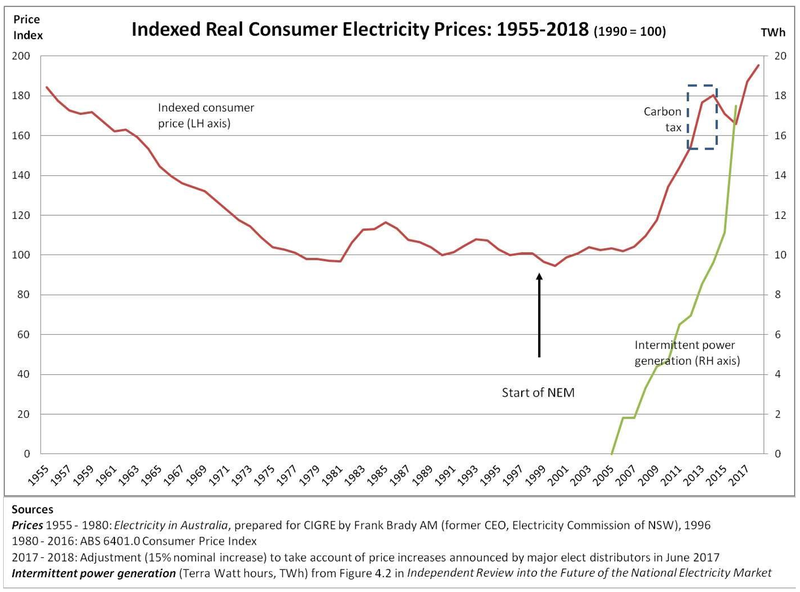 The grim, rising trend in Australian electricity prices, another state with a heavy investment in renewables is also surely significant. Meanwhile, in a renewables obsessed land Downunder …. Reblogged this on UPPER SONACHAN WIND FARM.